Easy PLA is a filament that you will get very good quality of prints, and avoid problems when printing. No matter what experience in 3D printing you have, print with EASY PLA will surely convince you to create even more demanding and complex projects. All thanks to the ease with you can now print. 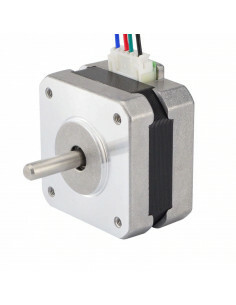 NEMA 17HS4023 stepper motor designed for use in extruders of 3D printers. The motor has a built-in XT connection socket. Engine dedicated to Titan type extruders, it is characterized by low weight. The FIBERLOGY PET-G properties enable you to create even more functional prototypes or finished products. This is possible due to better material strength than ABS. E3D V6 Heatbreak 1,75mm BOWDEN ALLMETAL clone dedicated to BOWDEN type M7 radiators, made of steel over the entire length. The Triangelab product.